In August 2014, Tuan Chau International Entertainment resort opened a ceremony to welcome world Guinness Record for the biggest artificial tourist port in Vietnam. Tuan Chau - Halong bay tourist wharf is a joint venture between Tuan Chau group and Quang Ninh provincial people's committee. The wharf is located in the southwest of Tuan Chau island, gate way to the World heritage Halong bay. The port is 1.700.000 m2 in total area, including anchoring waters and the port's entrance. Water surface is 650.000 m2, anchoring length 6030m, minimum depth of 10m and a maximum of 14 meters, a capacity of over 2000 cruise ships. The port is built with convenient pier system, fully equipped stations, restaurants, service areas of international standards, the wharf location is convenient for sightseeing activities, tourists boats docking at Tuan Chau also shorten the travel route compared to Bai Chay wharf. Tuan Chau wharf has become a reliable address of big cruise agencies with nearly 100 cruise ships operating plus thousands of passengers departing for Halong bay each day. The advantage of artificial wharf Tuan Chau - Halong Bay is located in a close area without wind, safe anchorages, 1500 meters from national waterway and very close to attractive sites in Halong Bay. The port has comprehensive infrastructure and facilities, is the ideal destination for cruise ships, carriers and domestic and foreign visitors. The construction of an artificial port was cherished for a long time by international Tuan Chau Group. To gradually realize the idea, in 2007, Tuan Chau Group conducted phase 1 starting construction of Tuan Chau cruise ship port 1 and was granted license to operate by Quang Ninh Department of Transportation. 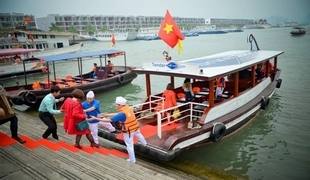 At the moment there are 3 wharfs for tourist boats in Halong city, one in Bai Chay area, one in Hon Gai and one in Tuan Chau island, some cruises travel Bai Tu Long bay usually start the trip from Hon Gai ward, other boats visiting Halong bay, Lan Ha bay or Cat Ba island dock at Bai Chay and Tuan Chau.